We have negotiated deeply discounted shipping rates with the top couriers to save you money. We can do this because of the volume we ship and the relationships we have with our trusted partners. You will immediately have access to the cheapest shipping rates available with partners including UPS, Loomis Express, Purolator, FedEx, DHL and Aramex. netParcel provides small and medium sized businesses with the best prices for small parcel shipping in their region and lane. Take advantage of our large network and find a better price for shipping small parcels. We provide instant access to over 40 LTL (Less-Than-Truckload) carriers for your large item shipping needs. Using the netParcel platform, rates are returned from only the most trusted providers, such as, Con-Way, ESTES, Day & Ross, Purolator Freight and Speedy. On demand access to LTL carrier rates mean you don't have to wait for spot quotes. Find the best rates for economy shipping and pick your carrier instantly. You can do it all from your desk with netParcel. With our platform, you also get access to up-to-date shipment statuses and tracking information. netParcel offers consolidated shipping services via our tier 1 carrier network. With offerings for US Domestic, Canada Domestic and International shipping to countries such as the UK and Australia. Consolidation is one of the easiest ways to take advantage of cheap shipping for small and medium businesses. Save more money on shipping by using our extensive network for volume consolidation services. Contact us to learn more about our consolidated shipping options and how we can help you reduce your shipping costs. We offer superior service and tracking combined with unrivaled prices. netParcel allows you to combine pre-existing accounts with our outstanding full service. We make your life easier, enabling you to import orders, publish real-time shipping rates, select the cheapest shipping rates, generate shipping labels and schedule pick-ups all at the same time. Add your existing account today and easily compare your current prices to netParcel's discount shipping rates for every shipment. You could be saving money on every package you ship. We make bringing your accounts to our cheap shipping platform simple. Find out why the cheapest way to ship a package is with netParcel. Through our rate comparison tool, shipping calculator and leading edge shipping platform, netParcel ensures the best cheap shipping rates possible and the most convenient way to manage your deliveries. Once you have compared the carrier options available, simply select the service and carrier of your choice. It really is as easy as finding the cheapest shipping rate operating between your base of operations and your package's destination. When you choose your carrier, you can also schedule a free pick-up and print your shipping labels without ever leaving your desk. Generate your Bill of Lading and enjoy low cost shipping without the hassle or stress of collecting quotes. It's time to simplify your shipping solutions. Awesome app, takes care of all the headaches of shipping and tracking. Highly recommend to anyone that doesn't want to waste their time shipping. Their prices make our shipping rates competitive. Netparcel is highly recommended for all merchants! It is super easy to use especially the option to intrigrate Shopify to instantly fulfill orders. It has saved us so much time! Truly an amazing service! netParcel is one of the best things that has happened to our business. It's dramatically lowered our shipping costs, particularly on large items going across Canada. If you ship products you have no excuse but to install netParcel. It will save you money instantaneously. netParcel is amazing! I have an Yoga & Activewear clothing store in Canada and Net Parcel replies to my emails. Fixes any problems that I encounter and is super cheap!!! Best rates anywhere!!! We at Fartech flip clocks love netParcel for two reasons. We love their competitive shipping rates, and the great integration with Shopify. Thanks! Love netParcel! Wish I had discovered it sooner! I was using Canada Post thinking this would give me the best rates but was very surprised that with netParcel the rates were better in most cases and I no longer have to make trips to the post office. Highly recommend netParcel. Your business needs economy international shipping. netParcel connects you with the cheapest shipping company offering delivery to your customers, whether they're in the U.S., Canada, or overseas. The process is simple. Enter package origin and destination as well as shipment details to see a full list of rates offered by small package carriers like UPS, Fedex, Loomis Express, Purolator, and more, as well as over 40 LTL carriers. Pick the cheapest shipping company for domestic, international, and LTL shipping. Then all you need to do is schedule pick-up and print out your shipping labels. When you're a running a business, you don't have time to get quotes from every courier around. You need the cheapest shipping company each and every time, but it doesn't make sense to lose hours hunting for one. Whether you use Shopify, Woocommerce, or take orders straight from your website, you need economy international shipping solutions that are reliable. With your customers located all around the world, there are too many international shipping companies to compare on your own. netParcel offers a quick solution for your discount international shipping needs. Think of us as your one stop shop for international shipping companies. Our rate comparison tool can save you hours of fetching quotes and comparing prices. You're a pro at ecommerce and you deserve an international shipping solution that's as easy to use as your own web store. Pick and click great deals the next time you need to send a package. Creating an account with netParcel can also streamline shipping for your business. 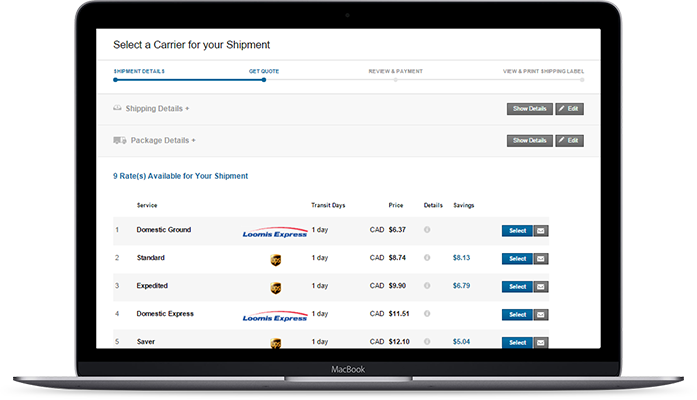 Connect your netParcel account to your ecommerce platform so that you can import orders and publish shipping rates in real time on your digital checkout page. Instantly enjoy discount international shipping as soon as you sign up. You can also use netParcel even if you already enjoy economy international shipping rates. Our platform can make shipping even easier for you and your customers. As a shipping and courier broker, we help small and medium-sized enterprises cut their costs and save their customers more money. The netParcel platform instantly connects you with the best international shipping companies you can find.